When Danielle Eckstein walks past the USS Gerald R. Ford, she is reminded of the small role she played. It never fails to bring a smile. If your image of working in a shipyard is of a grizzled guy weathering windy waterfront conditions with dirty hands, consider Danielle Eckstein. The 26-year-old is a mother of three, including twin toddlers. She didn’t tinker with tools growing up. She prefers an office job to working outside in the elements. 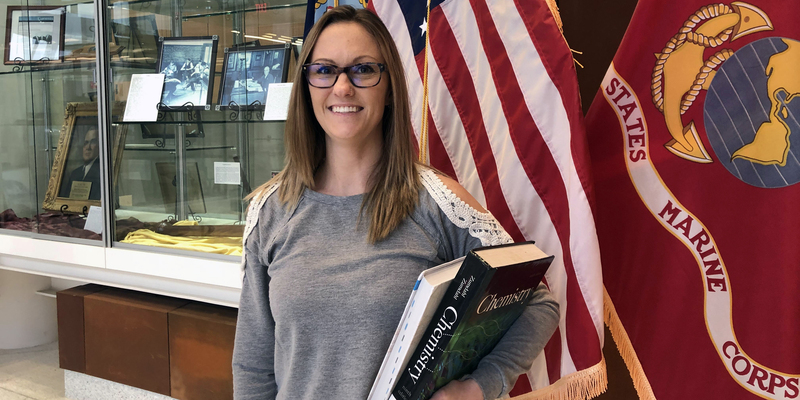 The Woodside High School graduate found the perfect career path as an apprentice at Newport News Shipbuilding, where she earns a competitive wage while she works toward her Associate of Applied Science in Engineering from Tidewater Community College. Eckstein balanced multiple low-wage retail positions after high school that left her frustrated every time she got her paycheck. Her father, Ernie, had long touted the opportunities at Newport News Shipyard, and finally he talked her into completing a training program that led to a wage position there as an electrician. Eckstein wanted more and applied to The Apprentice School, where she was accepted a year later. After competing basic coursework, she gained entry into the shipyard’s apprenticeship program. She started her initial coursework at the shipyard just two weeks after giving birth to twins, Camden and Austin. Now she’s immersed in a program that she regards as challenging and rewarding. Twice a week, Eckstein is on campus at TCC, where she juggles three classes, statics, differential equations and chemistry. The other days she works in the yard, but she doesn’t need to bundle up to handle the sometimes frigid temperatures along the James River. “I’m inside, in a nice warm office and I love it,” she said. Eckstein’s focus is on production planning, which involves working with digital software specific to shipbuilding. When Eckstein walks past the USS Gerald R. Ford, the lead ship of her class of Navy aircraft carriers, she is reminded of the small role she played. It never fails to bring a smile. And, once she finishes her apprenticeship and earns her TCC degree, Eckstein will be ready to achieve a supervisory role anywhere in the company. You might say her ship has come in. Interested in an apprenticeship? Contact Karen Miller at TCC’s Apprenticeship Institute at kmiller@tcc.edu. Visit https://www.tcc.edu/about-tcc/apprenticeship-institute.